About 5000 years BC the ancient Egyptians played a form of bowls whilst the pyramids were being built, using stone balls, which they rolled up to a stone cone. From Egypt it spread to Greece and Rome, where the Romans played “Bocci” – the word is still used in Italy today. Time travelling swiftly on, the Normans, who invaded our shores and fought the battle of 1066 with the Saxons, also used stone balls to pass the time between bouts of pillaging. Such fun. Red Indians in Canada and Maoris in New Zealand also whiled away the hours playing with stone balls, and there is also evidence of both iron and bronze bowls being used too. The sport seemed to have a fairly universal appeal, but this was quashed in the 14th Century when Edward III banned the playing of bowls along with other sporting activities, believing that English archers were neglecting their primary role and fearing that their effectiveness in battle would be impaired. Thus came about a ‘ban the bowl’ statute. This also included Real Tennis and forbade artificers, apprentices, husbandmen, servants, serving men and other ‘low born people’ playing. In 1541 during the reign of Henry VIII, a tax was imposed making bowls only accessible to the wealthier classes. The main reason for this was that Henry also considered that arrow-makers and bow-makers weren’t being productive enough, wasting their time playing bowls. This was not repealed until 1845, over 3 centuries later, during the reign of Queen Victoria. 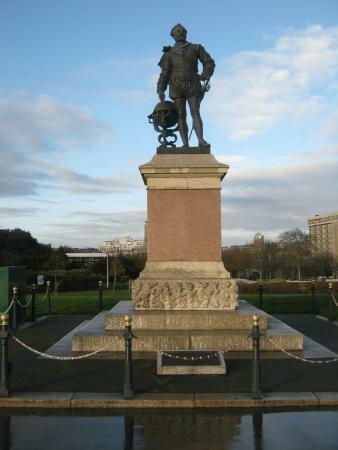 Did Sir Francis Drake break the law? When was the bias introduced? It appears that the bias on bowls came about by accident around 1522 when apparently Charles Brandon, Duke of Suffolk, broke a bowl and rushed indoors to saw off an ornamental ball from a banister (bet that pleased Mrs Brandon!!). Accordingly, one side of the bowl was flat and the new bowl took a curve at the end of its run. In the 1800s a firm in Glasgow called Thomas Taylor came into existence. Their main line at that time, was manufacturing wooden legs for soldiers unfortunate enough to lose them in the Napoleonic Wars. Up to 1871 wooden bowls had all been shaped by hand, but in this year Taylor’s patented the first machine for accurate shaping. Bowls were then table tested to ensure the accuracy of the bias. These were made from the hard wood, lignum vitae, originally discovered by Christopher Columbus. After the First World War there was a shortage of lignum vitae so manufacturers were looking for another material to use. In addition, the limitation of wooden bowls was becoming more apparent with loss of weight, shrinking, cracking and in some cases breaking. It was W D Hensell in Australia, in association with Dunlop the rubber company who developed the first rubber bowl. Then in 1930, operating independently, Hensell and his son Ray produced the first composite bowl, the forerunner of the bowl that we know to day. So true or false, we hope you enjoy this pot pourri of bowling facts. Our own history of bowls at TLH Leisure Resort only goes back as far as 1990 when David Bryant opened our indoor bowls arena – a unique facility for a Torquay hotel group. Since then many hundreds of bowlers have passed through our doors , taking part in our year-round calendar of bowling breaks, enjoying friendly competitions and tournaments throughout the indoor seasons. I have worked at TLH since Spring 2015. Although I haven't been playing bowls for very long, I definitely have the bug and play competitively for Torquay Bowling Club. Fascinating facts Terri – where did you learn all that info?